Imagine a small group of people – two men, an elderly woman and a child – entering a museum or a memorial site with a few heavy bags. They pay entrance fees and walk straight to one of the walls of the museum. They put the bags on the floor in front of the wall and take out work tools and construction materials: a hammer, manual drill, nails or screws, plaster, trowel, water bottle. Then they take out a big stone plate inscribed with text. Attached to it is a small black-and-white portrait of a young man, printed on an oval piece of porcelain. They talk quietly. The old lady helps with the heavy plate, carefully, worried. The two men drill a few holes in the wall. Some visitors stop to look at them, curious, others continue undisturbed. When the holes are ready the men attach the plate to the wall, add plaster, tighten the screws. The old lady holds the child’s hand firmly, observing the men work. A guided group approaches; the guide pauses briefly, looking at the men installing the plate. He guides his group to pass carefully around the working men and continues the tour elsewhere. When the work is done the two men embrace the old lady. She places a red rose on the plate’s frame and passes her hand over the small porcelain photo. They ask a random visitor to take their photo next to the plate and then leave. In any other museum, a happening like this is either impossible, part of an authorised art performance or it is stopped immediately through museum staff or police intervention. Legal consequences are sure to follow. At the Mauthausen Memorial however, there is nothing unusual or criminal about visitors independently installing plaques, photographs, other objects or inscriptions directly on the memorial’s walls. Dedicated as a memorial in 1947, the former Nazi concentration camp is not only one of the first memorials of its kind, it is also a pioneer and quite a unique practitioner of an ever growing and transforming, unattended, unregulated visitor-made commemorative exhibition. This phenomenon at the Mauthausen Memorial started more than sixty-five years ago, probably around 1949. 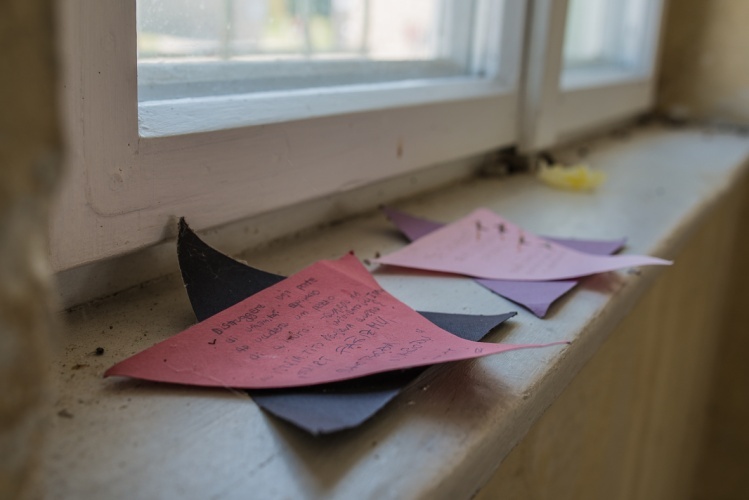 Since then, visitors have left more than 2,000 commemorative plaques, photographs and other objects in the Mauthausen Memorial. 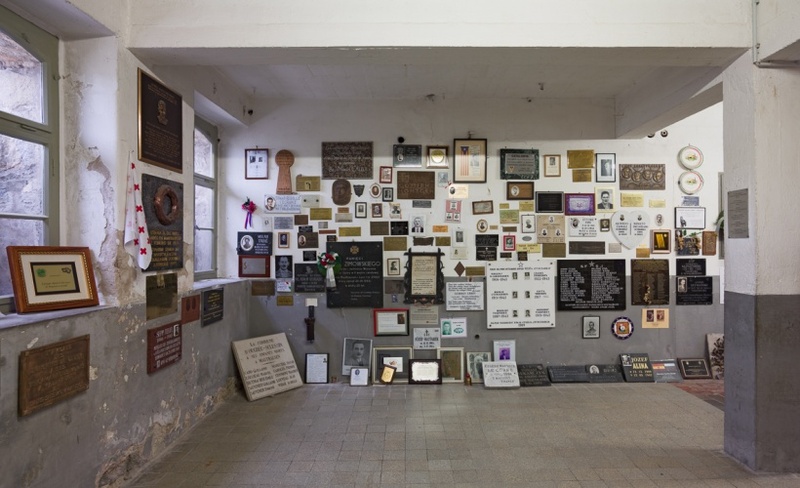 Hundreds more were installed in the memorials at some of Mauthausen’s former sub-camps like Gusen, Melk and Ebensee. Strangely enough, although being quite unique in the landscape of memorials to the crimes of National Socialism, or any kind of museum in general, this phenomenon has attracted significant research from neither a historical, nor a sociological, nor a museological point of view. 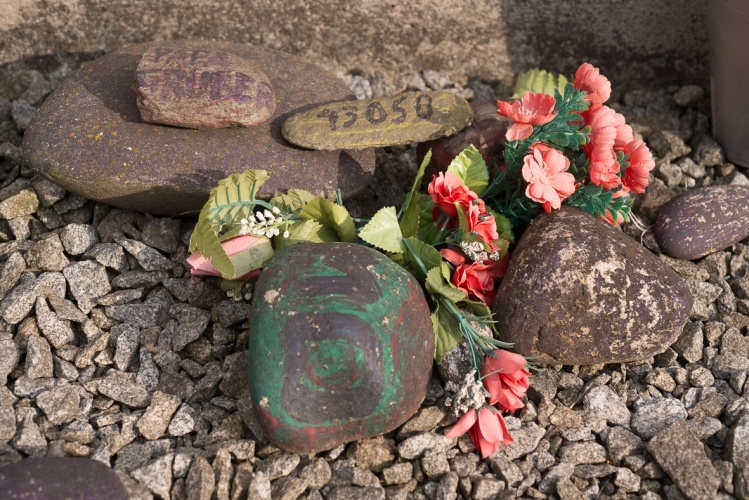 The lack of research makes it difficult to evaluate its origins and the circumstances that allowed this form of commemoration to flourish in Mauthausen. This text offers a few assumptions and a preliminary description of the phenomenon. More in-depth, dedicated research is desired. In 2009 I visited Mauthausen for the first time. I received a short, generic tour by a young volunteer, a ‘Zivildiener’. Towards the end of the tour we entered the museum building, the former ‘Reviergebäude’. As we approached the crematorium my attention was immediately drawn to what I saw inside. I entered the room and looked at the walls. They were covered from floor to ceiling with plaques of different sizes and styles, decorated with symbols and inscriptions in different languages. Attached to the plaques, etched on them and installed between them were dozens of photographs, black & white portraits, mostly of young men. 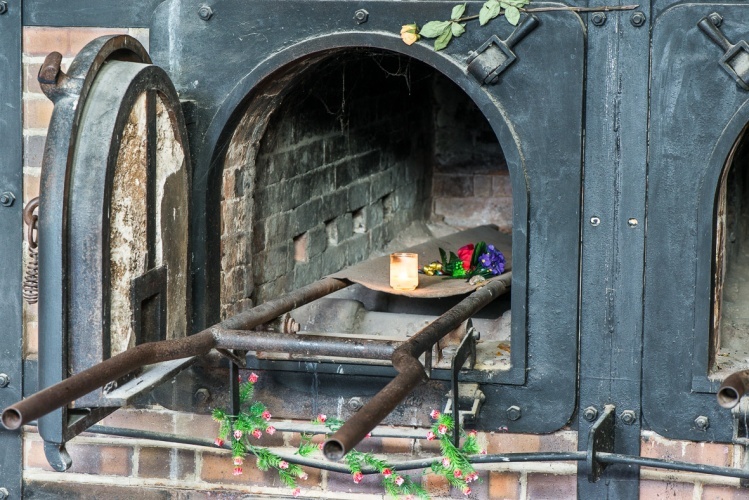 Other commemorative souvenirs were left next to, and even inside, the crematorium furnaces that occupied most of the small room: plastic flowers, candles, ribbons with names written in gold, national and associations’ flags, decorated stones, poems printed on paper. Opposite the crematorium furnaces, a large wooden frame with two locked glass doors was installed on the wall. Inside it, organised in rows but not entirely straight, around a hundred small black and white photographic portraits were attached with pins to the back of the frame. Small pieces of paper with a few lines of text were attached to each photo with another pin. The papers had turned yellow, some of the photos’ edges had curled up with old age. For a second I thought it might have been an installation by Christian Boltanski but what I saw there wasn’t as ‘clean’ and tidy; it looked too diversified and disarranged. It was the ‘real thing’ and it was fascinating. The abundance of portraits and plaques, their irregular assembly, the shine of the polished stone plates and golden frames, the vivid colours of the ribbons, flags and plastic flowers juxtaposed with the black and white sombre photographs, and all of this together surrounding the crematorium furnaces, was overwhelming. These aesthetics of eclectic, collaborative anarchistic design interfered with and intervened in the awkward crematorium block in the middle of the room, depriving it of its unchallenged dominance. This form of ritualised sacralisation added another meaning to the furnace. It was no longer about the ones who are commemorated; it was also about those who were left to commemorate. In a way, the presence of life – its continuation and persistence – prevailed over the presence of death – of annihilation and disappearance. There are other parts of the memorial with zones dedicated to independent commemorative plaques (and other ritual objects) for individuals or groups. Parts of the French and Italian monuments on the grounds of the former SS barracks are covered with plaques and photoceramics. Many walls in the former washrooms and the former ‘Bunker’ area are covered with graffiti left on the walls by visitors. Some other walls adjacent to the crematorium are slowly filling with plaques as well. 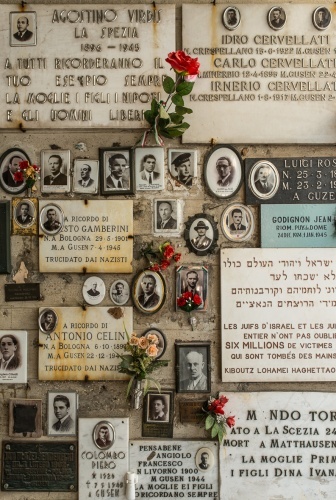 Most of these plaques are produced by the funerary industry all over Europe (but also the USA, Israel and other places) and display a wide repertoire of funerary cultures in these countries and their evolution over the last sixty-five years. This phenomenon at the Mauthausen Memorial could be described as an ongoing, permanent (yet ever changing) commemorative exhibition, curated/created by the public in an independent (yet participatory) way. Some aspects of it might resemble the appearance of spontaneous shrines but its context, duration, and the relations between the participants and the host institution make it unique. To understand why and how this phenomenon established itself at the Mauthausen Memorial it is crucial to look at particular aspects of the Mauthausen concentration camp and the first few years after its liberation. “Fred, my only Brother, I painfully miss you every day! However, the independent commemoration in Mauthausen poses difficult challenges as well: What is the status of these objects? How should they be treated? Should they be archived? How to write about and refer to these objects? Should they be cleaned? Should they be conserved? What to do with offensive, disrespectful or erroneous inscriptions or with vandalism? What was meant to stay permanently and what is regarded as temporary? What should this phenomenon be called? There is a fair amount of wear and tear of the objects, especially to those that were installed outdoors. The materials and techniques used to install them are not consistent and some objects fall and break. Images on some of the photoceramics left outdoors fade. Some of the staff and visitors are offended or saddened by the appearance of the damaged commemorative objects. It is difficult for the staff to determine – and there are no clear guidelines on – which objects are meant to stay and which can be removed: stones with inscriptions, paper works, offensive graffiti, used or unused candles, prints not attached to the wall, beads, things left on the floor… The same question poses great challenges from archival and conservational points of view. 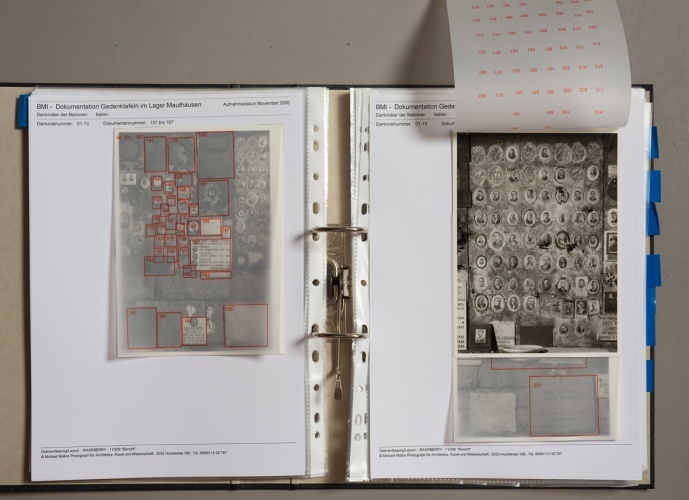 In 2000 the memorial took up a monumental challenge and documented thousands of the independently installed plaques, photographs and other commemorative objects in Mauthausen, Gusen, Melk, and Ebensee. The objects were photographed and numbered, inscriptions were transcribed and translated into German, and the measurements, condition, material and other information were entered into datasheets. This difficult and impressive work demonstrates the respect and sincere commitment of the memorial to the independent commemoration phenomenon. However, in the fifteen years since the completion of this survey, many new objects have been added, others have gone or were removed, but the archive has not been updated. In 2007, to meet some of these challenges, the memorial introduced new guidelines for visitors who wish to install commemorative plaques. A standardised application has to be sent to the administrative unit responsible for running the memorial and a few formal conditions have to be met. The new guidelines mainly seem to concern the issues of limited space at the memorial and being able to manage the installation, archiving and documenting of the plaques better. The freedom of the design of the plaques was not compromised. To understand the implications of these decisions that seem to allow the continuation of the independent commemoration phenomenon in Mauthausen, it is interesting to look at the ‘Memorial Cave’ at the Yad Vashem memorial in Israel. In 1981, participants of an international conference of Holocaust survivors convened in Israel. Independently they had produced small stone plaques commemorating their relatives who died in the Holocaust and asked Yad Vashem to keep the plaques. The plaques were installed in a small cave in the grounds of the memorial complex. However, the memorial authorities were concerned by the fact that the plaques were not standardised and decided to institutionalise and regulate the practice. A new cave was dedicated, next to the cave with the original plaques from 1981. Straight walls were prepared and a metal grid was placed on the walls. Since then, the memorial offers the possibility to commemorate individual victims of the Holocaust on these walls. The plaques offered come in a standardised design and a few sizes. Yad Vashem prepares and installs the plaques for the relatives of the victims who are interested in the commemoration. The families pay for the preparation and installation of the plaques; the prices increase according to the size of the plaques. Everything is set and standardised, the material, font, and installation. Only text can be placed on the stones. The families compose the text, which is limited by the plaque size. 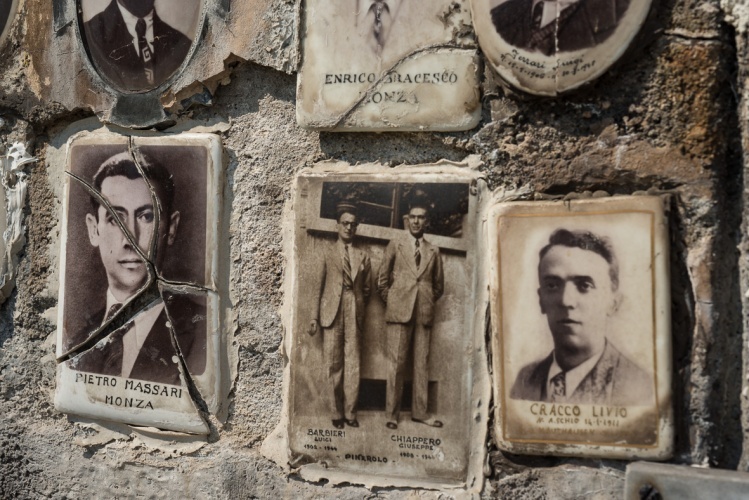 In both memorials, Mauthausen and Yad Vashem, the plaques are referred to by the same name: individual commemorative plaques. However, the differences in the practices, attitudes and aesthetics in both cases reveal the different circumstances, contexts, narratives and cultures of commemoration between the two places. In 1994, a Holocaust survivor filed a lawsuit against the Yad Vashem memorial, claiming that the Memorial Cave establishes inequality. He claimed that families who cannot pay or do not wish to pay are discriminated there. However, the comparative exercise reveals a little more. While commemoration at the Yad Vashem cave resembles the aesthetics of military cemeteries more than anything else, and commemoration in Mauthausen seems very participatory and based on civilian notions, the opposite is revealed when looking at the commemoration of female victims. 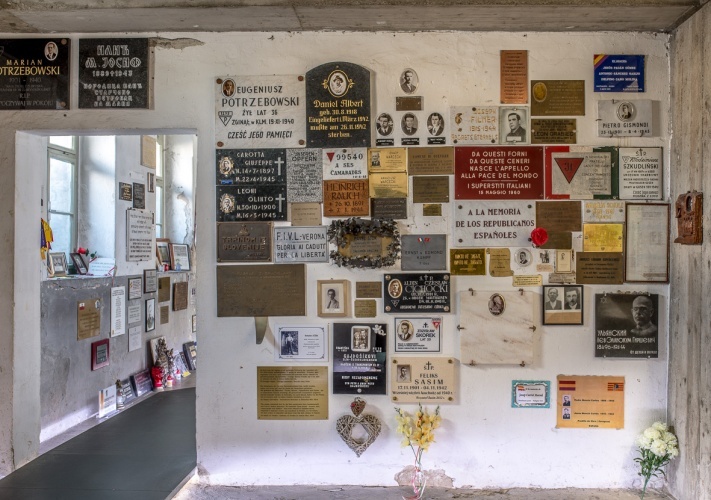 At least 4,000 women were prisoners at Mauthausen, more than 500 of them were killed there, but there are almost no independent plaques that commemorate them. Of the hundreds or thousands of photographs of victims left at the memorial, it’s very hard to find those for the female victims. 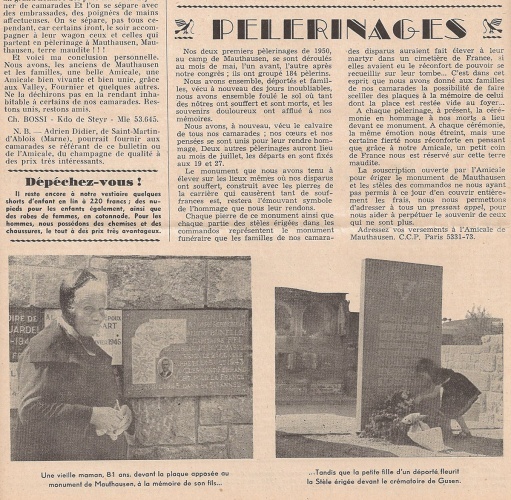 Perhaps the French influence on commemoration culture in Mauthausen was also at play here and the ‘fraternité’ aspect of solidarity and heroism was the only one possible. In this model, women took an active part in commemorating the victims, but much less so were they commemorated as victims themselves. At the Mauthausen Memorial, a concoction of elements – an uninterested society of perpetrators; the geographical and mental remoteness from the memorial of policy-makers; committed and politicised survivors with a pragmatic approach and an idealistic principle of international solidarity; the lack of individual graves for the victims; and a pinch of good old Austrian sloppiness – contributed to the establishment of a unique phenomenon of independent commemoration. It remains to be seen how this phenomenon, which has preceded other, supposedly (and only superficially) similar ones, will be approached at the Mauthausen Memorial in the future. Plaque for Alfred Joseph Kreisberg, born in Frankfurt Am Main on 27 July 1920, murdered in Mauthausen in September 1941. Dedicated by Isbert Kreisberg, Los Angeles, California, 2000. The full version of this article was first published in Memorial Book for the Dead of the Mauthausen Concentration Camp/Commentaries and Biographies, edited by Andreas Kranebitter, 2016. Tal Adler is an artist and researcher currently working at the Humboldt University, Berlin on the Horizon2020 project TRACES (Transmitting Contentious Cultural Heritages with the Arts: From Intervention to Co-Production). From 2011-2016 he worked at the Academy of Fine Arts, Vienna on the art-based research projects. He has been conducting extensive artistic research on contentious heritage and the politics of memory and display in Austria, publishing and exhibiting artistic work on difficult heritage at marginal and established museums, landscapes, sites of commemoration and education and civil society organisations. For over two decades he has been developing methods of participatory artistic research for engaging with difficult pasts and conflicted communities in Israel/Palestine and in Europe.